I’ve had this concept floating around my head for some time. It's really a half dozen of the 'Sustainable city' ideas all woven into one 'grand plan'. It starts with Urban Gardens. But instead of a few vacant lots or tomato planters on balconies, the city is wrapped in over 1,300 acres of farmland. Enough area to feed about 12,000 people a 100% local and organic diet. Each city block is no more then 1/2 mile long with extra wide sidewalks to encourage walking and biking instead of motorized traffic, but extra public transit routes added when the weather is less then desirable. I envision all the homes made primarily from re-purposed shipping containers with green-roofs. Locally and sustainably harvested wood and clay bricks right from the local soil can be added for facades and decor. Leasing out some of the farmland for wind turbines will offset electricity costs, and Methane reactors fed by community waste will provide gas for heating and municipal vehicles. By requiring all local businesses to manufacture as much as possible, with only sustainable, recyclable or compostable materials and renewable power sources, the local economy can also be self sustaining, providing all necessary employment and not at the mercy of volatile markets. Keeping the population density low will also make the city a far safer, healthier and more desirable place to live, with a large community park at the city center. If built, I believe this city would serve as the best example to other cities, as well as a model for all future Eco conscience construction. Thanks for sending along the interesting ideas, Christopher! The Eco City idea echoes a number of urban theorists from the 20th and 21st centuries who believe that replicable pods are the best way to grow a city. Also your idea seems to build on the greenbelt idea of surrounding the with a major amount of agricultural or forested land. What our team found most interesting was the idea of requiring local businesses to use and re-use local materials. The question that visitors might want to discuss is how the Eco City would write laws that adequately would police such a matter. Or would this community in fact be a co-op where people had to be voted in "membership" (either residency or business management)? Although the U.S. has a now elaborate history of zoning regulations that regulate where businesses can locate, we don't know of regulations about where businesses obtain their materials. Nor do we know of rules that require all businesses to manufacture something, which is what your thought-provoking article seems to say at some points. So the Eco City vision is well worth pursuing, and we'd like to hear from other readers what they think. It won't surprise those who have read much on this site that we actually like density and verticality in cities. However, we recognize a high percentage of the population wants to live more in horizontal space than vertical, and therefore would welcome the chance to help design and inhabit your Eco City. Almost any unused/underused farm will do. At each unit measuring a little over 2000 acres, there are many parcels on the market at reasonable prices at any given time. My personal preference would be somewhere in northern California or the Pacific Northwest, but the design is compatible/adaptable to almost any life sustaining region on earth. In arid climates the target population would need to be lower to account for harsher growing conditions, but the type of construction and crops grown (which is determined by climate and geography) make the final product instantly recognizable to the indigenous culture. Whether that be the steep sloped roofs of a snow packed Nordic country, or the flat, earthen designs found in many parts of Africa! I lost track of this page after writing the original post! To answer a few of the questions raised, yes the city is loosely based on theories by Ebenezer Howard of Garden City fame, John Leighton's Hexagon gridding of London, Frederick Law Olmsted's Parks and John Muir's theories on protecting nature for, and from man. Population density is critical to any city's success. Though there is also a threshold of 'too dense'. This design achieves about the same population density as Chicago or Las Vegas, without having to go vertical. As many studies have found, vertical construction actually hinders urban density because the cost of going up causes rent to soar. Tenants who can afford this also demand greater living spaces, thus negating the benefits while retaining the blight. 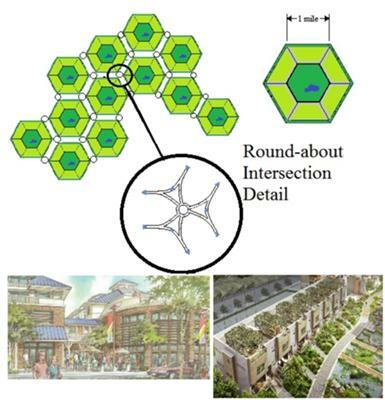 The hexagon design eliminates many of the cross streets found in a grid system (about 30%) thus creating more space for comfortable and affordable housing. As any city that hopes to be 'sustainable', the design necessitates a zero impute, zero waste approach. With no law written other than 'no hazardous materials' all subsequent products must be either recyclable, reusable or compostable. My current plan is to run this project on Kickstarter for both funding and volunteers. As the population would be made up of equal part owners of the land itself, yes 'co-op' would be the most accurate term. I am hoping to generate enough funding to purchase a large plot of disused farmland, preferably in northern California or similar. The current piece of land I am looking at sits in a valley between the Sierra Nevada mountains, and is currently only used as a winter grazing land for cattle. I like the idea but my question is "Where" would a city like this be located? Join in and write your own page! It's easy to do. How? Simply click here to return to Best City Plan.